Located on Calle Cristo , you can find outstanding bargains at this factory outlet bonanza. 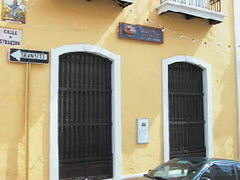 Its inventory offers the best leather bags, belts, accessories and shoes anywhere in Puerto Rico. There are several discontinued and imperfect pieces available at deep discounts. Buy carefully, but chances are that the imperfections are nearly indistinguishable.